In the industry, it is often called “silk screen printing”. In a nutshell, this process puts ink to apparel by way of a stencil that is burned onto a framed screen and then used to transfer ink onto any item you desire. Though it requires a tedious set-up process, it provides the highest quality print in the industry after years in existence. Once it is set-up, it is the most economical solution to reproduce the same image on hundreds, or even hundreds of thousands, of items. Impressionz Printing specializes in personalized tshirts and apparel for all your needs. Contact us today for a free estimate! Want to brand your own clothing? We can help. We offer customized label printing for branding your company name or just personalizing your own threads. Get pricing and details here. We use water based inks that are void of harmful chemicals and offer 100% organic garments for those who want the ultimate “green” experience when printing. Read more. Looking for that reflective type ink or want to add rhinestones to your shirts? We can handle it for you. Read more about the different types of specialty printing we do here! Need to get some sports team apparel printed up? We can do that too! We offer athletic printing for teams, schools and special events. Find out more here. We offer wholesale screen printing prices for those who need bulk or large quantity orders on a recurring basis. Get more info here. CMYK printing is best for full color images on white or light colored fabrics. It makes for an array of stunning vibrant colors. Read more here! Discharge printing is a skilled screen printing process where inks are printing into the fabric as opposed to on top of garments. Read more here. In a hurry? We’ve got you covered. We have some of the best turnaround times in the printing industry. Find out more about rush orders here. Our most popular printing method and the industry standard, this type of silkscreening is done with Plastisol printing inks. At Impressionz Printing, we only use high-quality inks that ensure product longevity and color vibrancy throughout the life of the apparel. Our main ink provider is Rutland Inc. out of North Carolina who has made us a phthalates-free shop. This guarantee will make sure your products are branded with high-end inks that will last a lifetime. Softness (hand) of print is vital to design. When design requires printing over seams. If the printed apparel will need to be ironed. Example #1: Wicking apparel when the imprint needs to be able to stretch. We must add a stretch additive that will increase cost. Example #2: Long-sleeve printing. Printing on the sleeve of a long sleeve t-shirt or button-up shirt takes longer to print. Check Out Our Standard Screen Printing Portfolio! 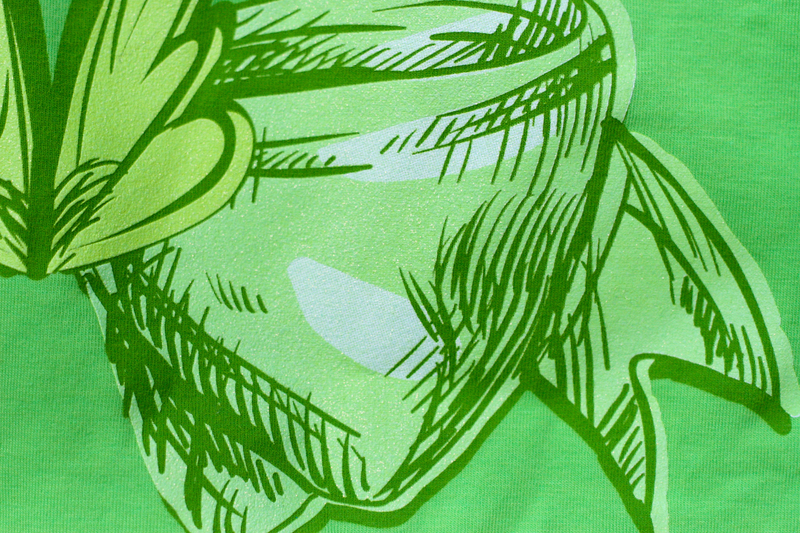 Water based inks offer an extremely soft-hand to the apparel that its printed on. But the inks tend to lose some of their bright colors once washed multiple times. At Impressionz Printing we use a discharge underbase with our softhand plastisol inks on top. This process results in very soft prints that remain vibrant throughout the life of the apparel. Our premium or hybrid-ink combination offers the best of both worlds. We use water-based discharge inks in combination with our standard plastisol inks to achieve very vibrant screen-printed apparel with a very natural soft feel. Since our premium inks cause for a discharge underbase we recommend printing on 100% cotton for best results.